The crises of life have often been compared to stormy seas. They come upon us whether we like it or not. They terrify us. They knock us around and threaten to destroy all our stability and security. We don’t know whether we can survive them. And we don’t know how long they will last. At least, that’s how a storm at sea would be for most of us. For Jesus, it was just a chance to grab 40 winks. 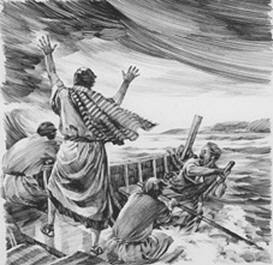 As Mark tells the story, the disciples were terrified that the boat was going to break up and everyone would die. But Jesus was asleep (on a cushion no less, Mark notes, adding to the contrast between Jesus’ tranquility and the disciples’ panic), apparently oblivious to their pending doom. They roust him and cry, “Teacher, don’t you care if we drown?” (v. 38). Of course, Jesus quiets the storm with a word, but then he chides the disciples: “Why are you so afraid? Do you still have no faith?” (v. 40). Some of the lessons in the story are obvious. Jesus has power over the storms of life, experiences them alongside us, loves us, saves us from them and wants us to trust him more than we do. Let’s look at a lesson that might not be so obvious. Storms don’t worry Jesus. He’s right there with us during them, but he’s perfectly calm about them. He isn’t terrified; he isn’t impatient; he isn’t worried. In fact, he’s so calm, he’s asleep. To us, he seems to be asleep at the switch. We wonder why on earth he doesn’t get up and do something. We start to wonder whether he even knows the trouble we’re in. Whether he cares. Whether he even can do anything about it. Whether he’s really all he’s cracked up to be. Maybe that’s why Mark included this story. The not-so-obvious lesson is that Jesus was just as much in control, and the disciples were just as safe in his hands, while he was asleep as while he was awake. Most of the time, life seems like a relentless voyage from one storm to the next. At least it does for me, and I expect it’s the same for you. One thing I’ve learned about myself is that during storms I’m usually a scared rabbit just like Jesus’ disciples were. Does it sometimes seem that God is ignoring you when you need him most? Has a trial you’ve gone through made you stronger spiritually? Do you feel that Jesus should keep you from going through trials? When was your faith most tested? Why does God let us suffer trials if he loves us?